You are here > Home>Latest News>Tuffa helped to raise almost £400 for Sport Relief! 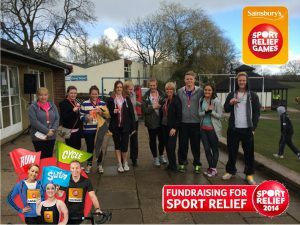 Tuffa helped to raise almost £400 for Sport Relief! 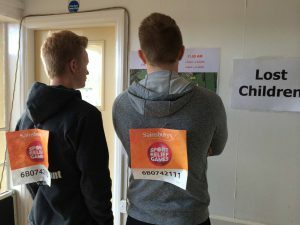 Well the day finally arrived, and on Sunday 23rd June 2014 all the office staff at Tuffa set out on their 3-mile Sport Relief challenge to help raise money to raise cash that will help to change lives, both here in the UK and abroad. The team arrived in Ashbourne at 10:30am ahead of the race in order to warm up in time for the 11am start. The weather on the morning was cold, wet and windy but that did not phase the team. We had our own Tuffa race going on, and the winner was James, the sport fanatic! A big well done to all of the team, Jackie, James, Daniel, Charlie, Steph, Amy, Dee, Sophie and friends Mandy and Laura. Also, a huge thank you to our much appreciated sponsors – you’ve certainly helped a fantastic cause! Unfortunately two members were lost on route. They were found waiting in the lost children area!